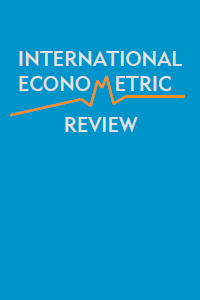 International Econometric Review (IER), sponsored by the Econometric Research Association (ERA), is an independent international journal which publishes semiannually. It is an open access journal. IER is indexed and abstracted in EconLit, EBSCOhost, RePEc, Sobiad and Ulrich. IER aims to publish articles of high quality introducing new econometric techniques to a wide variety of problems in economics and related subjects, covering topics in estimation, hypothesis testing, forecasting, and policy analysis. Applied papers using these new econometric techniques are also welcome. Regarding the applied papers, IER particularly gives importance to the replicability of empirical results. Therefore, authors are expected to make available their data set and computer programs in case readers, editors or referees want to replicate results reported in submitted contributions.